Have you ever wondered stalking at someone’s Instagram profile that what in the world helps them take such perfect travel pictures? If you are an avid traveler, this is probably one of the situations you would have faced. In this blog, we have made an effort of bringing together the secrets of taking better travel photos for you. The best thing about these is that you need not be a professional photographer & still have the perfect clicks. If you don’t have a professional camera, you can turn your smartphone into one by adding the right lenses. You can choose from Aukey lenses or Moment’s wide-angle lenses. Aukey lenses are an affordable option and also include further categories such as fish-eye filter lenses, macro lenses and wide-angle lenses. You can get smartphone lenses for every kind of phone, some can be easily clipped on and some need a special phone case to be places securely. Consider this travel photography tip for beginners and click better pictures on your next trip. Do you know the rule of thirds? If you do, how often have you used it correctly? We will reveal this secret of using your smartphone camera settings wisely. Whenever clicking pictures, turn on the camera’s grid which will allow you to see if the phone is leveled properly while shooting straight-on. If you have a fancy phone like iPhone Plus or its newer models, its pre-set light and portrait mode settings can allow you click perfectly professional-looking photographs. On a normal smartphone, you can adjust the lighting mode by decreasing or increasing the exposure. All you need to do is tap on a focal point on the screen and make the adjustments. One of the best tips for better travel photos for iPhone users is that they can use the feature of ‘Live Photos’ to develop a long exposure effect by clicking on ‘Effects’ setting in the phone’s camera app. Sometimes even with a right angle and good lens, a picture is not clicked the best. The design of a camera is subjected to capturing each minute detail, as much as possible which as a result makes the images flatter (color-wise) hat what it looks for real. To cope with this feature of your camera, you need to use an editing app to tune the image well and make it more original and lively. You can try Adobe Lightroom, one of the best free photo editing app available for both Android and iOS. It makes easier to transform the images into amazing travel photos. On using an advanced version of the editing app, you will have wider editing options to apply such as highlights, warmth, shadows, vibrance, sharpness and brightness. Do you want to know how to take travel photos of yourself? Have you ever tried taking a selfie in low light conditions? Was it good? Though it seems difficult, still you can take a perfect selfie in unfavorable conditions of low light by having a phone case that has in-built LED lighting. Did ever your phone slipped from your hand due to its big size? Use a pop socket for fine grip. What’s the shame to upgrade your smartphone and its camera for better travel photos! 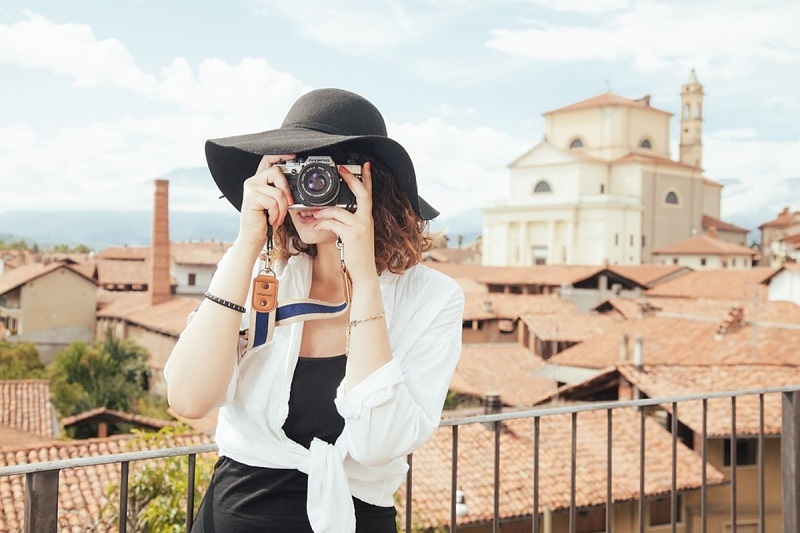 Being a traveler yourself, you must have come across several bird’s eye videos and images by now across the social media. Drone videos and photos are giving way to an entirely new picture of the world. What if we say you can have your own drone video the next time you go on a trip? Oh yes, it is possible! With the growth of drone technology, travelers can now buy affordable drones of their own to capture their travel experiences in the best way possible. You can choose one like Eachine Quadcopter Drone for easy handling or DJI Mavic Air for a better professional look. You need to know how to improve travel photography and the first thing to understand is that you don’t necessarily need a professional DSLR for brilliant travel photos. Yes, it is true. Instead of going for a clunky DSLR in your bag, buy a mirror-less camera (a smaller option) such as Panasonic LUMIX G7. It is a lighter and smaller camera that can be easily packed in your bag. Moreover, it is a better option that your phone, when it comes to power storage. Plus, you will also get the point and shoot features to use. Book cheap flight tickets at Indian Eagle for your next trip and pack all the necessary tools to get the best travel photos on this trip.